Put the needle on the record and rock with the CR6008A Tech Turntable. 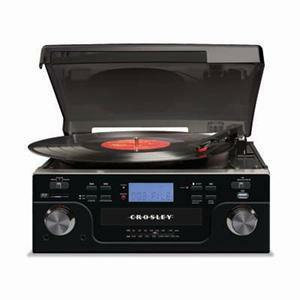 This streamlined turntable will easily transfer your vinyl directly to a USB drive or SD card. Dynamic full range stereo speakers offer clear, warm melodies that will quickly make this three-speed 1970's vintage turntable your favorite way to play all your music. The CR6008A also is Portable Audio Ready for easy connection to your iPod or MP3 player and features a CD player and AM/FM radio.